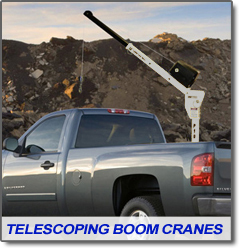 The unique Western Mule Telescoping Boom Cranes are not only versatile in their heavy duty lifting capability, but also in the manner in which they are stored; compact and secure, in a minimal amount of space. The Western Mule Fold-A-Way Bumper Cranes were designed to conveniently fold away into the bumper and out of your way when not in use. The heavy duty design allows you to lift up to 2500 Lbs depending on the model.